There are hundreds of Web sites devoted to various aspects of weather available today for the weather fan. This site cannot hope to match the depth provided in these. Rather, here the focus is on providing a ready reference of key links to other sites where more detailed specialized information or comprehensive lists of links may be found. This page began as an personal reference source -largely of sources listed in Weatherwise- and has gradually expanded in scope. Above, you will find links to the various pages here. Most contain brief descriptions of the types of information available from the various sources, to better assist you in finding the information you seek. Enjoy your visit! This site is best viewed at 1024x768 resolution using 256 colors or more. 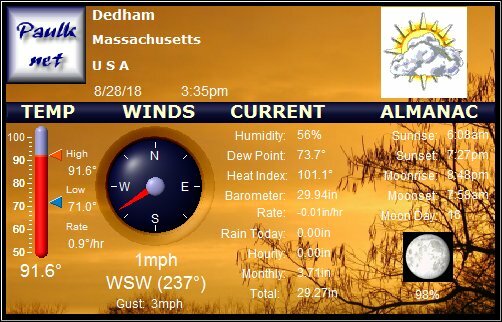 Click on the graphic for detailed Dedham weather conditions, updated every 15 minutes 24x7.